To trade with the Chinese was difficult both due to the geographical distance as well as the cultural differences. To keep things simple the Swedes brought all kinds of pure silver cash coins to China, mostly Spanish Pillar Dollars and the classic pirate money "Pieces of Eight" which were Spanish silver coins to the value of Eight Reals, well know to all readers of Robert L. Stevensons 'Treasure Island'. A complicating factor was that Swedish East India Company by Swedish law was forbidden to export Swedish silver coins out of Sweden. This, however, was then as now easily avoided by the corporate finance by not bringing back the export profits from the Swedish export business in the first place, but making them available against documents in Spain. Often as much as 5 tons of minted silver coins were brought onboard in Cadiz, physically transported there by all kinds of means, from different investors. Silver and coins to be used in the East India Trade: Spanish Eight Reals coins 'Pieces of Eight'. 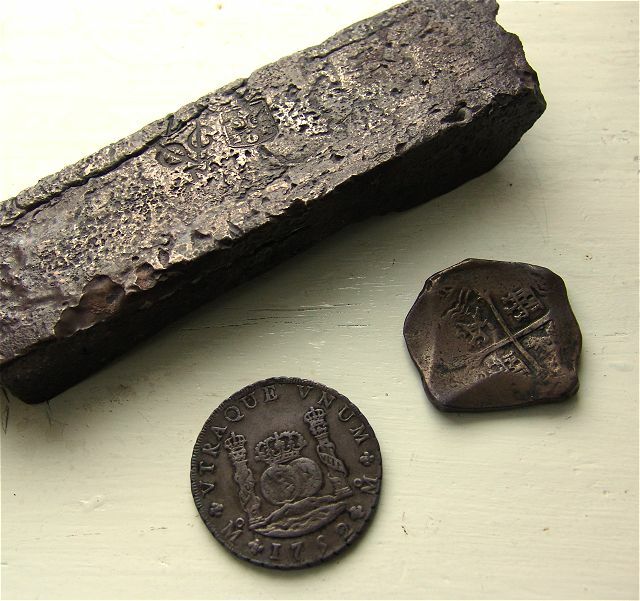 To the left a 'Pillar Dollar' type and to the right a 'Cob' type, and a bar of silver from the VOC, indented to be made into coins. Photo: Jan-Erik Nilsson, 2005 . The "Pieces of Eight" was the world's premier trade Coins and these first ones came in four different types. The first Eight Real coins were the "cob" type which were hand stamped over a period of two centuries. Their standard weight of 27 grams of .900 fine silver is the norm for all Eight Reals. The "pillar type" Piece of Eight is one of the most historical and beautiful coins ever minted. The two crowned globes represent Spanish possessions in the Old and New World. A third type that also found use in the Far East was the 'Cap and Ray' type (not illustrated). Its design was based on classical motifs and Mexican mythology. To look into what happened during the Gotheborg voyage 1743-45 and if possible find a clue to the disaster that ended the trip we will look into the bookkeeping and do some math. The coins that were picked up in Cadiz were most probably Spanish Eight Real coins also called "Pieces of Eight". The weight and value of these coins were standardized and the 47 chests of 4,000 coins each, contained all in all 188,000 coins with the nominal value of 1,504,000 Spanish Reals. At a weight of 27 grams of .900 fine silver, which was the norm for all Eight Reals, the total silver cargo was thus 5,076,000 grams or 5,076 kg or 5.076 tons of .900 silver. Besides making the point with VISA cards very clear, this was enough to give anybody a comfortable life. Of course the point with the China trade was to double the money at each trip as what had been done already at the first trip by Colin Campbell, in the Fredericus Rex Svecia in 1731-32, and then do it again, and again. So, lets continue the trip and see what happens.